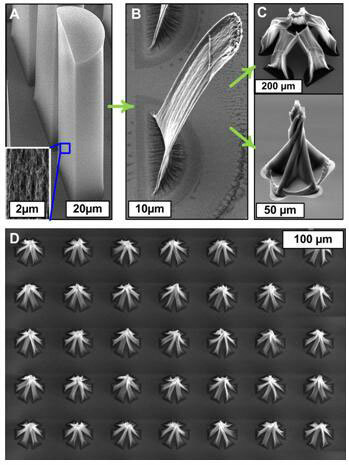 (Nanowerk News) Researchers from imec and the University of Michigan have reported a new technology to fabricate complex three-dimensional microstructures, with intricate bends, twists, and multidirectional textures, starting from vertically aligned carbon nanotubes (CNT) ("Diverse 3D Microarchitectures Made by Capillary Forming of Carbon Nanotubes"). The resulting assemblies have a mechanical stiffness exceeding that of microfabrication polymers, and can be used as molds for the mass production of 3D polymer structures. The method is straightforward, in that it requires only standard two-dimensional patterning and thermal processing at ambient pressure. 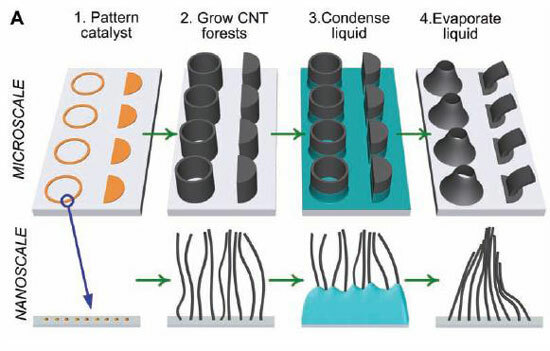 Illustration of CNT forest growth and capillary forming sequence. Complex surfaces with precisely fabricated nanosized features are needed in, for example, metamaterials, substrates for cell culture and tissue engineering, smart active surfaces, and lab-on-a-chip systems. But existing methods of fabricating 3D microstructures all have their drawbacks, requiring tradeoffs in feature geometry, heterogeneity, resolution, and throughput. This new method, which the researchers have termed 'capillary forming', promises a path to robust, deterministic fabrication of intricate structures with high mechanical stiffness. SEM image of CNT forests before (A) and after (B) capillary forming, as well as more complex arrangements of microstructures (C,D).